People begin painting for a variety of reasons: a social activity, such as a painting class; a pleasant way to pass a few hours; an experiment, simply to see if they can. For many, it is a wonderful and valid hobby, to occupy the mind, engage the imagination, and keep motor skills active. In my case, painting was a natural progression from a lifetime of producing drawings in pencil, colored pencil, and pen and ink. A lifelong desire to paint was put off until I reached my sixties. Once begun, it has become a passion that can’t be ignored. Just as painting was a progression from drawing, the use of gouache grew out of the direction those drawings were taking. I had begun using gouache for backgrounds and underpaintings for my Prismacolor pencil drawings. As the underpaintings became more extensive, I eventually set the pencils aside, and proceeded to just paint. In the beginning, the transition from sharp points to soft brushes was difficult. I found myself attempting to “draw” with a brush, and it wasn’t the look I wanted. I am a simple man, with simple beliefs, and as a result, I take a fairly simple approach to painting. I don’t experiment with other media these days. I’ve dabble briefly in oils, acrylics and pastels in years past, but today, my focus is exclusively on gouache. Painting is one of the most difficult things I’ve tried to do. Achieving the look I want with gouache is enough of a challenge without spending time experimenting with other materials. Many of my oil painter friends wonder why I don’t switch to oils. After all, most galleries prefer it, it sells better, and the general public is familiar with it. Gouache, on the other hand, is thought of as just another form of watercolor, and the public, as well as many artists, never heard of it. For me, it was, and still is, primarily a matter of convenience. It has also presented its own peculiar challenges that I just can’t resist. The use of gouache is centuries old. From the Italian “guazzo”, meaning “water paint”, its use appears to go back some 800 years, used originally to illuminate manuscripts. Early European painters used it as an outdoor sketching medium, and it was used extensively during the golden age of magazine illustration because of its fast-drying characteristics. There are other sources of technical information about gouache, so I’ll speak here simply from my own experience. Gouache, like any other medium, can be used in a variety of ways, and since every artist works differently, others will have different experiences. There are a lot of very fine artists working with or experimenting with gouache today, and I am in awe of what some of them do. For most, it is an occasional diversion from their primary medium of oils, watercolors or pastels, and some use it for plein air, or outdoor, sketches. Very few fine artists have used it as their primary painting medium. Later in this article, I reference a couple of artists who I know do a lot of experimentation with gouache. In addition, the names that come up in any discussions about gouache that I have participated in are Erik Tiemens, Nathan Fowkes, Thomas Paquette and Marc Hanson. All have websites and/or blogs where one can see their wonderful work. Gouache (gwash), also called opaque watercolor, is heavier than traditional transparent watercolors, with a higher pigment to water ratio. It has unique properties and peculiarities, among them an extremely fast drying time, and the fact that colors dry to a different value than when they were originally applied. (In general, lights dry lighter; darks dry darker.) This provides an interesting challenge to the painter, especially if work is being done over several sessions. Gouache dries very quickly, both on the painting and on the palette. However, it is rewettable, and remains active, apparently for years. I have a little plastic foldup watercolor palette that I took on a trip recently. It still had dried globs of paint from some outdoor sessions nearly a year before. I rolled a wet brush around on it, and it was good to go, although it never quite softens up completely like out of the tube. I generally use this dried paint thinly, to lay out compositions, draw initial structural shapes, and establish large color masses with thin washes. When I’m ready to really start painting, I squeeze out fresh paint, working in a gouache version of alla prima, in the sense of working wet-in-wet. I’ve incorporated a step-by-step demonstration at the end of this article to show my process of developing a painting. Because gouache remains “live”, unless it is fixed in some way, wet paint – or a wet brush – stroked over it will activate the existing paint, and the existing paint can mix with the fresh paint. Referred to as “lifting”, this characteristic is frustrating to many people who don’t use gouache very often. Because of my own painting method, I embrace this characteristic and make use of it extensively. Will the gouache crack? They say it will if applied too thickly. The problem is, I can’t find a definition of “too thick”. It might if done on paper, or any flexible support. I have worked primarily on illustration board, Multimedia artboard and masonite, and I’ve applied paint fairly thickly at times, but I don’t think it’s thick enough to be in danger of cracking. I’ve tried using a palette knife a couple of times, but so far haven’t gotten the hang of it. It’s probably just as well. Gouache dries to a matte, suede-like finish. It’s pretty tough paint, and unless the surface is scratched, it holds up well to being handled. Because it dries immediately, I often stack finished boards in boxes without slip sheets. I find paper difficult to work on, and because I varnish most of my work and put it directly into frames without mats or glass, I prefer working on a more rigid support. I’ve worked on Crescent board, gessoed masonite, and most recently on Multimedia artboard. Each has its own surface characteristics, and adjustments have to be made from one to the other. Masonite remains rigid, of course, but both the Crescent and Multimedia board need to be taped down or clipped to a stiff surface. There are many other surfaces out there to paint on with gouache. Since I haven’t tried them, I’ll only address those that I’ve used. I work on both gessoed and ungessoed Crescent illustration board, although I have begun to simplify my life by painting most often on ungessoed board. I prefer the cold press, because I do like a little texture to work on. Different weights of Crescent board seem to have different texture patterns. The Crescent board has plenty of absorbency to take the paint well, which I like. One drawback is that I can’t wipe a passage out completely. Also, too many rough strokes with a wet brush will begin to rough up the surface. Because I varnish most of my finished work, I often cut the board with some empty border space around the painting area. I tape it down to either foamcore board or masonite, because when it gets wet, it will warp. I also use those little black spring loaded clips. The border also allows me the option of matting the painting if I choose to. The paint will act differently depending on whether you gesso it or not. It seems to have a softer, suede-like appearance without gesso, and I think there is less lifting. Gessoed illustration board will not be quite as slick as gessoed masonite. A number of people have expressed the frustration that gessoed masonite is a slick surface, and difficult to paint on. They are partly right. I think “slick” may be a bit of an overstatement. It is definitely not a porous surface that the paint sinks into. How do I paint on it? The only answer on this one is, there is no easy answer. You just have to experiment – with the ratio of paint vs water, and the touch of the brush. Austin, Texas artist David Clemons was one of two people who suggested masonite as a potential surface for gouache, so I figure I’m safe. I sometimes wonder if David doesn’t have a laboratory attached to his studio space, because he does a lot of research and experimenting with paints and surfaces. He’s a gold mine of information regarding gouache and casein You can find lots of opinions about gouache (including David’s) at www.wetcanvas.com. Go to the Casein, Gouache, Egg Tempera forum. I used to buy masonite panels off the shelf at my local art supply store, but not anymore, for reasons stated in the following paragraph. They come in most of the standard sizes, smooth on both sides. I’m sure I could find untempered masonite at one of the big stores like Home Depot or Loew’s, but I just simply don’t have room for a table saw. A note of caution: I have had the paint peel from a gessoed masonite board. Close inspection makes it appear that the gesso didn’t adhere to the masonite. There have been a couple of thoughts proposed on this from other artists. One is that the masonite had an oily surface that wasn’t cleaned thoroughly. The other is that I should have prepped the masonite with a sealer before brushing on the gesso. It has also been suggested that I wasn’t using the right kind of gesso. One of the most likely scenarios is that I was using acrylic gesso on tempered masonite, which apparently has some oil in it. I have been told that acrylic gesso will work fine on untempered masonite. I have suspended my use of masonite until I decide if I want to spend the time doing extensive prep work prior to starting a painting. Future lifestyle plans will call for keeping my processes as simple and uncomplicated as possible. This is true “pick it up and paint on it” stuff. Made of paper and epoxy resin, it takes the paint extremely well, and for a short time, became my favorite support. It’s roughly in the same price range as Crescent board, but doesn’t warp when extensive wet washes are used. While it is thin and doesn’t warp, I still use a couple of very small pieces of tape to attach it to a solid surface like foamcore board. It’s been around a long time, and appears to take virtually any media. Like the Crescent board, I can’t completely wipe off a passage to repaint. A coat of gesso may take care of that. There does seem to be a slightly longer drying time than with Crescent board. We’re only talking about minutes here, so it’s not often a problem. This is good stuff, but I’ll admit, I find myself returning to Crescent board, maybe because of the more absorbent texture. I’ve used a gesso brand off the shelf at my local store, Demco Artist Series, white, for oil and acrylic, and also more recently Liquitex Acrylic Gesso. If or when I take a new approach to gesso and/or masonite, I’ll update this section. Let me say very clearly that I am neither an advocate nor an opponent of varnishing gouache. Some people do, most don’t; and some vehemently oppose it. It is a personal choice. I do it. Those who oppose it have valid reasons: it gives a glossy surface (depending on the angle you view it), and it does change some of the colors, although it mostly appears to just revitalize the colors to the brilliance they had when first applied. I have also used Krylon Matte Finish spray, which appears to provide good protection as well, without the glossy finish. When a painting is finished and signed, I apply several coats of spray varnish, and, if necessary for work on illustration board, crop it to fit directly into a frame. Most artists seem to prefer the soft matte finish of gouache. I’ve been swimming against the current most of my artistic life, and continue to do so in this respect. Varnishing eliminates the need for a mat and glass, restores the original brilliance of the paint, and gives the finished piece the look of a small oil painting. I kind of like it that way. I have found that on larger pieces (16×20 is large for me), getting smooth coverage is difficult. In assuring that I get complete coverage, I seem to overdo the spray, resulting in some areas being more glossy than others. This is only noticeable when the work is viewed from an extreme side angle. I have pieces that were varnished almost two years ago, and see no changes other than those that have been mentioned. I make it clear when displaying my work that it is varnished. I can only tell you what I’ve told others: try it on a couple of your absolute rejects. It’s a very personal choice, and I don’t want to feel responsible for anyone feeling like they ruined a wonderful piece of art if they aren’t happy with the result. I use Krylon Kamar Varnish. It’s a spray varnish and should always be used outdoors. I generally let a painting sit for about a week before varnishing, I lay the painting flat and apply a light first coat, then one or two more light coats after that, waiting about an hour between coats. I believe a single coat would suffice, but several coats assure me that I’ve covered the entire painting well. It dries very quickly, touchable after less than fifteen minutes. Watch out for bugs, because they will become part of the painting if you’re not careful. To avoid bugs, I spray a piece, then move it into my garage immediately and lay it on a flat surface. I can frame a piece within an hour of spraying the last coat. It’s not magic, and is really an easy process. The label says it’s non-yellowing, acid free, and allows easy rework, although I haven’t tried to rework a varnished piece. This resin varnish is marketed as an archival lifetime finish that should never yellow. However, if it is damaged or degrades, it may be easily removed with mineral spirits or, for spot repair, a pencil eraser. It may also be painted over if there is damage to the underlying paint. Kamar is a blend of B67 and F10 museum quality acrylic resins. These are harder than B72, but remain soluble if retouching is ever required due to damage, and may be painted over. How do I know all this? Krylon is one of the few companies that will actually tell you exactly what is in its products (no secret formulas). This came from a factory rep, who assured me that Kamar will last a very long time, does not yellow, and is easy either to remove or paint over. It can be used with oil or waterbased paint. It has been twenty years or so since I experimented very briefly with oils and with acrylics. Much has changed in terms of mediums that can be used with them to either speed up or slow down their drying time. My knowledge of both is limited, so in making any comparisons, I’m going to restrict myself only to my own experience. There can be a similarity to oils, in that one can apply bold strokes over existing paint, and a loaded brush can create strokes that resemble those produced with oils. One probably shouldn’t work in a thick impasto technique, however, due to the possibility of cracking. Unlike oils, gouache dries almost immediately. It can, however, be mixed and blended directly on the painting, like oils, because it remains “active” even when it is dry. Like acrylics, gouache dries quickly, even more quickly than acrylics. However, unlike acrylics, it can be reworked months, even years later. A wet brush will reactivate gouache, and new color can be blended into existing paint, directly on the painting. No medium is required other than water. I remember toning down, or changing the temperature of an acrylic painting by going over it with a thin wash. The same can be done with gouache, although it has to be done very carefully and patiently. The brush must be cleaned after two or three strokes, and the wash must be applied with a very, very light touch. While an acrylic painting, when dry, can be placed directly into a frame, a gouache painting must be framed under glass unless it is fixed or varnished. I should say first that I have no real experience using transparent watercolor. In terms of paint, transparent watercolor is, of course, the closest relative to gouache. They can be used in very similar ways, but also with completely different methods. Many artists have used the two together, presumably laying the groundwork with watercolor, then adding more opaque gouache strokes over it. Some mix white gouache with transparent watercolor to make it more opaque, and many use white gouache for touchups and highlights. For me, pure gouache offers the best of both worlds, allowing me to use thin transparent washes when desired, and thicker more opaque passages with strokes akin to oils. I have read that some watercolor societies don’t recognize gouache, and that some watercolor shows and competitions don’t accept gouache. I don’t consider myself a watercolorist. I am simply a painter who uses a water soluble paint. While I generally begin with washes, as a painting progresses, I sometimes tend to paint like an oil painter. I use bristle brights and filberts, as well as some small rounds and liners. I like for a brush to be somewhat stiff, but still have some flexibility. I do not use top of the line, expensive brushes. Gouache on a textured surface will wear brushes down pretty quickly. A square brush won’t stay square for very long. For his plein air gouache work, Mark Hanson uses cheap craft brushes he gets at one of the major craft store chains. I felt better after reading that, because I use a lot of those myself. If you’re going to use gouache primarily for studies, don’t invest in the same quality brushes you use for oils or watercolor. Experiment with cheap brushes first. And by all means, don’t use the brushes you use for those other media. I use DaVinci Gouache. I can buy larger tubes online at a reasonable price that definitely beats my local art supply store’s prices. I went from a student brand in the beginning (Reeves) to Windsor & Newton, and saw a big improvement in the way the paint flowed. I finally went to DaVinci, and saw no difference. Artist’s who experiment with different brands seem to prefer other manufacturers as well, citing smoother coverage or fluidity. I suspect preferences depend a lot on painting styles and techniques, and for the way I paint, DaVinci serves my purposes quite well. Anyone who has followed my use of gouache for any length of time will recognize that when it comes to materials, I tend to take the view “if it ain’t broke, don’t fix it”. I am a peasant, I’m afraid, more likely to be swayed by practicality than by trend. I have one of those nice wood palettes with the thumb hole in it, but it’s never been used. Since I work in a water-soluble medium, I use a cheap aluminum baking pan with a snap-on plastic lid. For the size I use, an 8×10 piece of glass, with a neutral colored board under it, fits nicely into the pan. Gouache dries VERY, VERY QUICKLY, even on the palette. To keep the paint from drying out too fast, I squeeze it out on folded strips of wet paper towels, and spray the paper towels regularly while I’m working. When I remember to spray one last time and put on the lid, the paint will stay wet for a day, sometimes three days. A spray bottle is essential, as is the standard roll of paper towels. Like most artists, I’d love to have a huge studio attached to the house, or in a barn, but we live in a condo/townhouse, and space is at a premium. Because my studio also serves as sleeping/play space for our grandchildren when they visit, I try to keep my actual work area pretty compact. Here, next to my easel, is my painting setup. As you can see, it isn’t fancy, and doesn’t take up much room. When we need the space, I simply pour the water out of the jars, put the lid on the palette, toss everything in a big plastic bin and put it on a shelf in the closet. Of course, then there’s the easel, the work table, the frames, and assorted boxes, but they all have a hiding place as well. An inflatable air mattress comes out, and we have an instant sleeping space. It means living without a studio for a couple of days, but that time is spent enjoying family anyway, and setting back up is generally a quick operation. My wife and I have a long range plan… to eventually live and travel in a motorhome or travel trailer, exploring the country, painting, and doing a wide range of shows, large and small. The convenience of gouache will surely come into play when that day comes. While paint, brushes, and board don’t require a lot of space, framed art and spare frames and framing supplies do. That will become a challenge when our lifestyle changes. Pretty fancy, huh? Now you know why I will never be part of a studio tour. I study, and observe, and try to learn from the experience of those who have portrayed the landscape before me, but when it’s time to paint, using the principles I’ve learned, I tend to let intuition take over. The painting becomes part observation, part science, part memory and part imagination, with, quite often, a strong dose of emotion. I began painting at a drawing table, but my dear wife bought me an easel, and once I began working at the easel, my work changed rapidly, and started taking on a more painterly look. In the photo below, you will see that I do occasionally have a print of someone else’s work nearby, simply to study how they painted certain passages. In this case, it was a Clyde Aspevig painting, primarily for the way he painted the foreground grasses. I have no hesitation about learning from others. 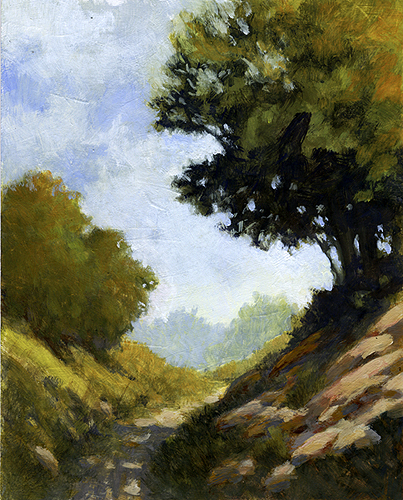 I generally paint in silence, trying to hear the ripple of water meandering past stones in a creek, the soft swish of a breeze in the leaves and grasses, those mysterious buzzing sounds one hears when the sun is shining and every footstep kicks up a little cloud of dust on dry ground. What follows is a step-by-step explanation of how I paint. This painting is 8×10, on gessoed masonite. It was done almost entirely with very cheap, flat synthetic bristle brushes, primarily a 1″ brush, and a few smaller ones toward the end. I begin almost every painting the same way, with a very loose sketch, simply establishing the composition and the main shapes. Yellow ochre is my preferred color for this, and I work fairly wet, sometimes wiping out areas, sometimes simply going in with darker strokes as I make adjustments. Using a mixture of ultramarine and burnt umber, I establish my darker masses and shadows. Because I tend toward warm in my paintings, I like the blue/purple as a beginning for the cooler shadows. They don’t always end up cool, but at least my heart’s in the right place at the beginning. Because gouache remains active, easily wiped out with a wet brush or paper towel, the ochre lines don’t concern me. They will eventually disappear in most places as I work over them, or remain in a softened form, giving the appearance of a warm undertone in the finished painting. Next, I establish the warm areas, using pure yellow ochre, still working very wet. I’m a big fan of California urban landscape painter William (Bill) Wray, and Bill continually stresses “warm against cool, light against dark”, and I try to keep that philosophy in my head as I develop a painting. Here, I’m simply establishing where the light hits. Due to the “lifting” characteristic of gouache, a very light touch with a wet brush is called for here, because in some areas, I’m simply layering light washes over darker undertones. Even though it remains active, gouache dries on the surface very quickly. Within only a couple of minutes, I’ve taken a damp paper towel and wiped some areas, not being overly cautious, just to pick the paint out of some places, and soften edges. The damp paper towel will cause some of the colors to blend a bit, depending on how heavy a touch is used. Too heavy, and everything is wiped out; too light, and not much happens. I’ll also use a dampened cotton swab (Q-tip) to pick out some lighter spots. Using ultramarine, lemon yellow, yellow ochre and red, I start experimenting with greens. (Every painting I do seems to be an experiment where greens are concerned.) I probably use way too much yellow ochre, but it does seem to unify the painting. Most of it will disappear as the greens are developed further, but some will remain and glow through the other colors. I’ve carried some of the greens down into the water, and again use a damp paper towel to very lightly blend some of the color and soften the brush strokes. I’ve begun to build the sky very lightly at this point, with combinations of ultramarine, yellow ochre, a touch of red, and titanium white, all applied pretty thinly. I’m letting the sky colors carry into the tree edges, taking advantage of the lifting characteristic of the gouache to soften some of the edges. I’ve punched in a few sky holes at this point, trying to get some definition to the tree masses. I’ve continued to slowly work on the greens, and in some places the paint is being applied with a bit thicker consistency. I’ve carried the sky color down into the water a bit more opaquely as well. Although the horizon line is still undefined, I’ve let the colors blend there as they may, through a variety of wet brush strokes and use of the damp paper towel. From this point on, it’s a continuous cycle of opaque and transparent strokes, of pushing and pulling the lights and darks, the warms and cools, putting in the distant horizon tree line, and getting some definition into the water by pulling the sky colors and reflected ground and tree foliage. The painting has reached that “now don’t screw it up” stage. I’m happy with how it’s going, and know the look I want to end up with. Touches of yellow ochre/titanium white in the clouds give a bit more warmth to the sky. Then it’s a matter of simply working the greens until I’m satisfied, touching up the highlights and tweaking the skyholes. A few added strokes in the grass area punch those areas a bit. Someone has pointed out that my skyholes are a bit rough, and I suspect the far waterline is a bit too harsh, but it does draw the eye to that area. Although that’s fine with me, I may touch a few of those things up before varnishing. The progress images are digital photos, and the finished image is a scan, so colors and sharpness are a bit different. I’ve also sharpened the progress images slightly, so the brushwork is more visible. I’ve included a blowup below, taken from the scanned image. I believe it goes a long way toward illustrating the layers of paint, the brushwork, and the edges that are developed through lifting and wiping. In the enlargment, the strokes and edges created by the bristle brushes appear sharp and harsh, but from three feet away, this painting has a very soft look. Overall, I’m happy with it. It already looks nice in a frame, and once it’s varnished, it should glow on the wall. The process shown above was photographed and/or scanned in January 2009. As my work continues to evolve, I find myself continually exploring a wider variation of color, softening edges, and experimenting with brushwork. However, the process, in general, remains the same. I try to publish posts of new work often here on the blog. Thanks Ralph, this was very informative. I came here from WC. I am also starting up in gouche/watercolor after not painting at all for over 20 years. I do make Ukrainian Eggs and sell some from my site but, now that I am really retired (I can relate to your situation there) I want to try and pursue something I started years ago. Your information has been a tremendous help as I really don’t care for canvas even though I have lots of oils and several stretched canvases ready ( which I will probably use since I am so cheap!) but have only done wc on paper. I have ordered a sheet of premium watercolor board to try out as it needs no stretching either. Again, thanks for posting all this. I’m just starting to paint in gouache after using oil paints for many years, and the two have very similar qualities. I’m glad to hear about your varnish technique. I want my gouaches to be displayed more like oils than like watercolors, and I like working on panels. I will try it. Valerie, once one gets accustomed to the characteristics of gouache, there really are some similarities with painting with oils, I think. Especially when painting on the gessoed panels. On illustration board, it’s more of a thick watercolor feel, and a softer look. Just remember to use a light touch when putting new strokes over existing paint. I still get some lifting when I stroke too heavy or too many times. Wet strokes will lift dry paint very easily. Regarding the varnish, I can’t stress enough that you should experiment with a reject. To date, I’ve got two done on gessoed masonite, varnished, that have a paint peeling issue in one spot. That’s out of about 70 or so that have been varnished over a two year period. I honestly don’t believe it’s the varnish itself, but I’m trying to study them to see what might have occured in those isolated spots. I love your work, by the way! Thanks for stopping by. Has anyone tried coating their masonite board with wall primer? It has great adherance and can be tinted any color. I suppose you could still gesso over it if you would like to. I have used it for many years, and never had any problems. I do oils and acrylics, but found your article interesting. Since you like Kamar Varnish, here is some information on the product for your interest (I also use the stuff). This resin varnish is marketed as an archival lifetime finish that should never yellow. However, if it is damaged or degrades, it may be easily removed with mineral spirits or, for spot repair, a pencil eraser. It may also be painted over if there is damage to the underlying paint. Kamar is a blend of B67 and F10 museum quality acrylic resins. These are harder than B72, but remain soluble if retouching is ever required due to damage, and may be painted over. Angus, I really appreciate this information. If you don’t mind, when I do some revisions/rewrites to this page, I’m going to quote it. Thanks! Thanks for the article. I have been painting in watercolour for a number of years. However, I am a great admirer of the work of Eugene Galien Laloue, who worked extensively in goache, although he did work in watercolour and some oils. So this Autumn I am determined to learn to use goache. In my search for info, I have come across many references to artists who tend to diminish goache saying why dont you use oil or wtaercolour or acrylics. All I can say is that Laloue produced stunning paintings in goache, and that is good enough for me. Visit the online REHS gallery to view his paintings. Again thanks for the info. Mike, thanks very much for bringing Laloue to my attention. You’re right: absolutely stunning work. I’ll revisit his work a lot, I suspect. It’s amazing how he could portray a crowd scene with only hints at detail along with two or three rendered figures. Nice to hear from you. I wonder if, artist to artist, you would answer a question for me about gouache? I had to do a repair job where it was used thickly as a wallpaper medium. The problem is a little complicated, so you can contact me thru my website and I’ll explain it. If you did, I would be so grateful! I can’t tell you how awesome your paintings are, I didn’t realise gouache could be so diverse. I have used it in the past only as an addition to acrylics. But really awesome work and you have an organised studio too. I’m so far behind in my responses that it’s kind of embarrassing. Van, thank you so much for the nice words. Beautiful work, great dialogue. Would you be willing to share what colors you typically use in your palette. Any particular favorites or constants? Those you avoid? Many thanks! Again, I truly apologize for taking so long to respond. Ken, I don’t buy a lot of different colors. I have a fairly standard palette for most of my landscape work: yellow ochre, burnt sienna, burnt umber, yellow medium, red (DaVinci just calls it “red”), ultramarine blue, and titanium white. I will often substitute lemon yellow for the medium yellow, for no special reason. I also occasionally pull out payne’s gray, venetian red, cobalt blue, cerulean blue and sap green, and ivory black. I have a tube of alizarin red that rarely gets used. I’ve only just found your site… came across it while looking for some gouache inspiration online, and feel like I hit the jackpot. I paint in oil, and I’ve just begun experimenting in gouache as a way to do exploratory studies of paintings at home, before heading over to my tiny studio to work them up in oil. Like you, I live in a condo. I can’t bring myself to work with oil and solvents in our living space, and I disliked spending so much time at my rental studio (it’s a tiny closet, and too far from home). So, gouache has been perfect for thinking through a painting without the overhead of oils. But your gouache demonstration, and your absolutely gorgeous landscapes, are so inspiring that I’m sure I’ll have an insane backlog of gouache projects in no time. This is a gorgeous website, and I so admire your style! Thanks especially for using digital images that show your lovely brushwork. I’ll be using them near my easel as a reminder that I have so much to learn! I hope you find your way up to the Pacific Northwest some day. In the meantime, Many Thanks! Kathleen, thank you so much for such nice comments. The reasons you are using gouache are exactly the reasons I have stayed with it. I’ve watched a few oil and acrylic painters get kind of addicted to it. Who knows, maybe someday we’ll make it up your way. In another 2-3 years, after my wife retires, we plan on hitting the road and doing nothing but see the country and paint. Quick question. If one was using gouache on arches stretched [300g/m2] paper and wanted to spray varnish the painting – should this be done before the painting is cut off the board on which it is stretched or can the painting be spray varnished after cutting off the board on which it is stretched without risk of buckling, etc.? Would appreciate an answer from anyone on this one. Matthew, maybe someone else will stumble onto this and have an answer for you. I don’t paint on paper, so I can’t answer this. (Actually, the illustration board is paper, of course, but permanently mounted on a stiff board backing). I have a question back at you: have you test varnished a reject piece to be sure you really want to use varnish? What a generous man you are to take the time, in an entirely disinterested way, to help others. I am going to try some of the methods you illustrate here.Although I’m an art teacher, I must admit that I am not as organized in my approach as you are. I really like the way your work suggests depth and layering. Bernadette, thank you for those very kind words. I’ve been helped by a lot of other people on this adventure, so I feel the need to share as well. I’ve been an artist all my life, most recently – for 15 years now (!) concentrating on pastel. I bought some gouache awhile back and it’s been sitting around unused until I found your blog. I’ve read it with much interest and now can’t wait to try what I’ve learned from you. Thank you so much. You have been most generous. Mary, drag out that gouache and see what you can do with it. It lends itself to a wide range of techniques and styles. Thank you for your nice comments. Ralph,thanks a lot from Brazil ! I’m 19 years old and trying to learn gouache painting by myself,since I’m cheap,and this website of yours is helping me a lot with so many great references and stuff. Again,thanks a lot for being so genereous. Hi Jonathan! I’m glad you’re able to gain something from my ramblings. Enjoy the learning process. I was just browsing the web trying to find information about gouache paintings and stumbled upon your website. It’s really excellent! Im 15 and was thinking of starting to paint more. I enjoy drawing with pencil and charcoal a lot and i even do some digital work. However i was wondering if you think gouache is the right medium to start painting with? It strikes me as a fairly basic and clean type of paint compared to say acrylics or oil, is that right? Anyway, love what you are doing! Keep it up. Glad you found me. Thanks for the compliments. I think gouache is an excellent medium to start with, especially if you haven’t spent too much time with other painting mediums. Some oil painters seem to have trouble adjusting to it at first. For you, as a teenager, it has the advantages of being washable (as in when you get it on your clothes… even at 66, I have a bad habit of wiping my fingers on my jeans), and there is no smell from oils, turpentine and other oil painting things. There is also the storage issue. Because the paint dries immediately, gouache paintings can be stacked on a shelf or in a box as soon as you stop working on them. You can’t do that with oils. It’s also very versatile in terms of painting techniques. I’m about to post a new step-by-step explanation of a new painting I’ve just finished. You might find it interesting. Should be up on this blog by this evening. Thank you for your advice about using gouache. You gave a lot of interesting information about how to use gouache. The way you paint shadows is similar to latvian artist Vilhelms Purvitis ( you can see some of his works here – http://www.artnet.com/artist/695813/vilhelms-purvitis.html ). While looking at your paintings, I can only seak inspiration and hope that one day I will be able to paint nearly as good as you. Thank you! Hi Elza. I’m glad you found me. Thanks for the kind comments and the link to Purvitis’ work. Cam, the only hazard I’ve found with gouache so far is that it’s addictive. Personally, I think it’s one of the cleanest mediums to work in. If my ramblings are of value to you, then I’m glad I’ve posted them. I just discovered your site, Ralph, and am really pleased to read your post with its honesty, and straight-forwardness. Your work is simply beautiful! I learned to paint in gouache, and I feel fortunate that I did. I find, like you, that gouache is a very clean medium that I can easily work with in my apartment. I also love the vibrance of gouache colors; my paintings are mostly abstract and geometric in nature, and gouache seems perfect for this. One question: do you find that some customers are afraid of purchasing gouache due to its perceived “fragility” and the need to frame it under glass? I’ve heard of people who feel this way. I have found that people buy a painting because they like it. As you’ve presumably read, I varnish my paintings with a spray varnish and put them directly into the frame, with no mat or glass. Maybe it’s the subject matter, but aside from asking what gouache is, people don’t seem to have any other concerns. Even artists who know what gouache is are usually interested in the technique, with only an occasional passing question about the framing. Customers are easily reminded that any piece of art should be protected from moisture, and shouldn’t be displayed in the direct sun. After all, they’re going to hang it on their wall, not use it as a placemat or coaster. I know that sounds a bit flippant, perhaps, but after all… it should be handled like any other piece of art that one paid good money for. Thanks for the tips!I usually use acrylics.Tried watercolor -love it but not the framing expense-saw gouache today and it will be my next move! Cathi, going directly into the frame sure eliminates a lot of hassles with glass and mats. I also do some small 4x6s occasionally, put them in little photo frames, and sell them as “Tabletop Gems”. Love the bouys! Thanks for responding, Ralph — I’m always grateful to hear from other artists about their experiences. You gave me a great idea: to just varnish the work and put it into a frame. I paint on 1/8″ thick panels, so this should be easy to do. I’m glad I’m on your newsletter mailing list, too, because I look forward to reading your newsletters. Hello Ralph. Read your blog with interest being a closet gouacher myself. I love any water based paint although I primarily use watercolour in the purists sense. I have done extensive experiments with both mediums in the past and would like to draw your attention to a small device you can make yourself which could open even further possibilities in your use of gouache. I’ve written about it on my website via the following link. I hope you dont mind me attaching the link. Like you I consider myself to be a simple soul, there is nothing in it for me except the hope that other people will get as much pleasure and fun from their painting adventures as you and I have obviously had. I enjoyed your writing and your demo. Great explanation and demo. Most people don’t know or understand that Gouache is a legitimate medium and technique. I paint with transparrent watercolor and gouache, blended. I mix them together as I paint. I varnish some, but mostly still mat & glass. Crescent CP watercolor board is my favorite, but do ocassionally work on aqua board (clayboard) or gessoed wc board. Thanks for sharing, and keep up the beautiful work. I hope I get the opportunity to meet you someday. Thanks for looking in, and for the positive reinforcement. Went to your website… absolutely beautiful work, my friend. Love your gouache paintings and your penciil drawings too. I’ve only recently found your site and not had a good look through yet but I definitely will!. I mainly use transparent watercolours (funny that, I always used to just say watercolours!) but I’ve just recently bought a starter set of WN gouache and a couple of extra tubes and started to dip my toes in – so far I love it. It’s quick drying (like acrylics) with relatively no mess (unlike oils) … but most of all it’s forgiving and workable (unlike watercolour). It seems to have all the advantages of the other media with no real disadvantages. Some really useful and well written information here for artists of all levels. You have a real passion for art and it shows in your words as well as your work. Glad you found me. Most of the time, I still refer to them as “gouache” and “watercolor”, unless I’m specifically trying to differentiate between the two. I’ve only started dabbling with transparent watercolor, still keeping it pretty small, more as a change of pace and a diversion, after four years of pretty intense focus on gouache. But, I’m finding I really like the transparency, so I’ll certainly do more, although gouache will remain my first choice for larger work. I’m always gratified that there are folks who do read this and find something useful. Thanks so much for the kind comments. I am experimenting with gouache on mount board cut-outs. It is a little slick compared with my rough watercolour paper but is very stable and easy to handle. Do you have any advice on using mount board? Sorry for the slow reply, Doug. I haven’t used gouache on mount board (I’m guessing that’s the same as mat board). I would have thought it would be rough and very absorbent. I think Deborah Secor has used it quite a bit, and it seems I’ve read of others on WetCanvas using it. It’s a good way to use those scrap pieces, though, especially for experimenting. Lynn, this business of varnishing gouache opens up some really passionate arguments on both sides. Many, many gouache painters believe it should be left alone, and framed under glass. I started doing it for one simple reason: I wanted an alternative to glass. Then I found that Gordon Snidow varnishes his large gouache paintings, and was satisfied with my decision. It’s a very personal choice, and I personally don’t believe there is a “right” answer. If you and your buyers/collectors are happy with the way you frame your gouache work, then you should leave it alone. I do it strictly because: a) I hate glass, and plexiglass is expensive; and b) I like the way my paintings look without a mat and glass; and c) my collectors seem perfectly happy with the way they’re framed. Whatever you do, don’t go spraying varnish on a painting that’s been part of your home for 10 years! You may not like the way it turns out. I always, always tell people to test it on a piece you’d probably not sell. That way, if you don’t like it, you haven’t done any harm. Thanks for your advise. I am experimenting with gouache and this is most helpfull! Ralph, I just discovered your site. Someone mentioned your name in our “Gouache Corner” on the Wet Canvas web site and I decided to look you up. I would say we seem to be kindred spirits in our painting philosophy. You’re just a lot better at it. Anyway you have a new fan. Hi Ralph, Was just cruizin the internet and saw your website. I use to use designer gouache in art school and always liked for its vibrant flat colors but never tried using it in washes. I have always loved watercolors and I think that was why I was so open to gouache. I remember laying out large flat areas of opaque paint without any blemishes was always a test. lol. Also I remember it flaking and cracking if you got too heavy with it. Have you ever tried egg tempera? Love your work, nice style. Hi Tony. I paint on a fairly stiff surface, so cracking isn’t an issue for me. Never tried egg tempera. I don’t think I have the patience for it. Thanks! Really a welcoming introduction to gouache , like an amateur would expect . I have been to your site countless times and marvel at your generous information on gouache. I, too, have been bitten by the gouache bug and there’s no turning back. Acrylic just dried too fast though very handy for some things. Oils I love, and use in an entirely non-toxic manner (no oms, turps, etc) and of course they are a sensual delight to paint with, but aack, what a mess and certainly don’t travel well (for me). I’m caring for my elderly dad now, and packed up my gouache in a small box and have everything I need. I do want to ask a few questions though: I pour my tubes into a watercolor palette and work out of that. I have discovered through experimentation and must credit gouache painter Roz (http://rozwoundup.typepad.com/roz_wound_up/gouache/) for many gouache tips, that there are two gouache paints that are truly rewettable, in terms of palettes. M Grahams and Schmincke. I love the ease of working from a palette as opposed to pouring out fresh paint each time from the tube. (Lazy?) I haven’t tried DaVinci gouache though….so do you know if it would work in a palette? If so, I love the idea that they come in large tubes. Your paintings are breathtaking…..you sure do bring a landscape to life! My style is perhaps what one would call contemporary. But gouache does what I want it to….and it continues to teach me every time I sit down to paint. It is such a magical medium! Of late, I add india ink either before or on top of my gouache paintings and it’s just way fun, the bold black lines with the awesome matte color. Gouache and ink are my joy. I LOVE that you varnish your gouache paintings. The Kamar varnish is really good, but egad, toxic. So sometimes I spray a light film of kamar, then proceed with a brush on varnish, usually semi gloss so I don’t lose that lovely velvety matte look that is so uniquely gouache. Well, thanks again for your info, I will be back frequently to see what you are up to. Love the idea of travelling around in an rv…..and the simplicity of gouache painting certainly makes that possible. Thank you for sharing your work and knowledge of technique. Your work is thrilling. I searched on gouache and landed on you site. I recently came upon a a bundle of paintings I did while in college. Each painting was done with gouache and the colors are strong and vibrant still. Of course they are not in the light so, I was wondering if they will hold up to sunlight. I see you use varnish to protect your work. I just wanted you to know that I am excited to try my hand at painting again. I am 65 in a few days and I think it is time to begin a new chapter. I will try and keep you posted if I learn anything along the way. Thanks Riyad, and thank you to everyone else who has commented here. I must apologize for taking so long to respond. The blog isn’t notifying me of comments, I’m afraid. Goucahe have given me the creeps since art school where we were made to create perfect , non-streaked, tiny swatches, hundreds of swatches, of tonal scales, cool to warm, grays. It was tortuous, but I’m thinking that might make me a quick study for landscape painting with them. Your painting makes me want to pick them up again, though I’m still not ready to put away my acrylics. It’s hard to screw up with plastics. Thank you for this thoughtfully composed and detailed article; I’ve been debating with myself for several weeks whether or not to start using gouache, but now I’m certain it’s the right medium for me. Thanks for the info. I am also a newb when it comes to painting. I use gouache and acrylics now, and I am trying to find a style. Your information is very helpful. My 10 year old daughter is just starting with guache…thanks for the very helpful tips. i will let you know how she gets on in about 20 years time. Thanks again. I wish her the best, Barney. She will be ahead of me in no time. Dear Ralph, very useful information. I am just getting started on Gouache, and I found this inspirational as well as informative. Love that riot of pigment on the board. Thanks! Ralph, I really like either Crescent or Strathmore Illustration Board for Wet Media for gouache. But I have a tough time cutting it straight unless I do it with the huge cutter at the art supply store. Can you tell me how you trim yours? Jan, I’ve got an old tabletop mat cutter that I’ve had for years. The only problem is that I have to buy board already cut to 20×30 so it will fit in the cutter. I buy my boards already cut too. I use Canson if I go to Hobby Lobby. Or I can go online and use Blick. I also use Ampersand panels and Canson papers 5 in a pack. Hi Elizabeth. I’m so glad to hear from you. Comments like yours make me realize I need to get back to some (at least somewhat) regular blogging. Thanks for the kind words. I’m glad if what I have offered is of some value. An amzing amount of material – am always awed at the generosity of the web community – people willing to make their expertise available, so thanks. Now, a question – in your list of other media you do not mention poster colour. Is that because it is beneath contempt, or equivalent to gouache, or is it a different beast entirely? Does what you say about gouache apply to poster co;our? Misha, I haven’t used poster color since I was a schoolboy; and am not aware of anyone using it as a fine art medium. That doesn’t mean no one is. I’ve seen some amazing drawings/paintings using crayons, but have never tried it. I simply can’t speak to its characteristics as a painting medium. I suspect it is much thicker and opaque than gouache, and without sealing it, would probably crack and flake quite easily over time. Thanks for your comments and your inquiry! Hi Ralph! I’m new to gouache. I have been having issues with the paint smudging when handling it, so I’m going to go the varnish route. Have you used the Krylon workable fixative? I have a can and was wondering if it would work. I’m not sure what you mean by smudging, but I have used Krylon workable fixative on gouache to fix a layer before proceeding with more paint. Didn’t like it much because the fixed surface didn’t take the paint as well. I’ve been tempted to try it again with a little lighter coat. So far, I’ve never had anything I’ve used turn yellow or otherwise change the painting. Just my own personal experience, mind you. Hi Ralph! Thanks for the quick response. What is happening is that my gouache paintings end up with a powdery residue on top which smudges easily. I contacted the manufacturer of my paints and they say it is normal due to high pigment loads but no one else in wetcanvas is having similar issues with other paints. So I thought of applying a fixative to see if I could save them. Thanks for the info and such an informative blog! There are people who feel that if it’s not oils, then it’s not legitimate painting. All I can do is refer you to the website of Gordon Snidow at http://www.gordonsnidow.com/about.asp . Check it out and then decide for yourself if it’s legitimate. No you won’t sell as quickly as oils nor get as high a price.. Sometimes one just has to decide their own direction. This just happens to be mine. Thanks so much for looking in. Come back often. All the best in your painting endeavors. Thanks so much for all your generous information. I do plein air oil painting but decided to try the gouache for lighter traveling. My husband and I are both painters and air traveling with all the oils, easels etc. gets pretty cumbersome. We are on our way to Victoria, BC for a Senior Hockey Tournanent. When my husband isn’t skating, we are plein air painting. Will try the gouache again with some of your wonderful hints. I’ll let you know how it all works out. Jacque, somehow I missed your comment. I think you’ll find traveling with gouache is pretty easy. Very nice to hear from you. Can you tell me ow you store your gouache paints? Kate, I’m not sure I understand your question. The DaVinci gouache I use are tube paints. Once I squeeze them onto the palette, I use a watercolor palette that can be closed with a top that seals. I leave a wet papertowel folded inside the palette, which keeps the gouache moist for an additional day or two. Wow! I didn’t know that! thanks for asking Kate and thanks for yet another great tip on how to use guache! We did go to Victoria and had a wonderful time. The gouache will work fine but I need to work wit it at home first. Did to a little while in Victoriam but did more sketching. I am teaching drawing class so just wanted to work more on using graphite sticks and pencils. Jacque, I meant to respond to this one. I can appreciate that you spent more time sketching. It’s something I need to do more often. Sketching and drawing were my first art loves, and I’ve neglected them, I’m afraid. I use and admire the appearance of gouache on paper. To get the hang of painting with gouache took a long time but eventually it came into its own with me. I don’t use it as you do–as far as I can tell from the website. I use it as a water-based, luminous medium between oils and watercolors. I dislike watercolors and find that acrylics are something else again. Gouache is no good on absorbent paper but it goes to heaven on polished-surfaces like some Strathmore paper. I tend to dislike gouache when it is opaque–and used for design–or watery. The trick is to hit its sweet spot between opaque and watery. I’ve always said that everyone takes a different approach when it comes to gouache. Unlike you, Richard, I love using it on illustration board (absorbent paper) in a very opaque manner. The differences are part of the beauty of making art, don’t you think? I wanted to thank you for this post 🙂 I am taking a design class and we just started working with gouache (Winsor & Newton). Our first project was to make a grayscale chart from white to black in 50 steps. Our teacher told us to mix up the gouache out of the tube, then add water to make it flow on to the Bristol (smooth) paper, but not so much water as to make it transparent. The most maddening part of the exercise was that it dries so quickly on the palette! I used over half a 14 ml tube of white just making all the grays. I searched online this morning to see what more experienced people do in this situation, because it seemed a little over the top to have all that dried gouache all over the palette. Haha! Now I know that I could have added more water to regenerate what was already there, rather than continue to add more gouache. I, too, love the matte look of gouache. And have discovered a way to varnish them that is (for me) totally compatible with the natural look of gouache. And that is, I wax varnish them. So the natural opacity in the wax complements the gouache without effecting or saturating the color as with acrylic type varnishes. I’ve been wax varnishing my paintings for the past two or more years and have had many requests to show my process, so i put this tutorial together. If you are interested, here’s the link. Big thanks to Ralph for sharing all his gouache knowledge and experience. I’ve learned loads from this site and am continuing the all gouache tradition, too. Betty Brown Australia. Thanks for answering a lot of ,my questions. Only just started to use gouache and didn’t know how to handle the thickness/thinness question. I feel I can be much more bold now in how I handle the mixing. Liked the step-by-step too – ..gave me a much better idea of how to progress from start to finish. You inspire me to do more. Recently I bought I set of Reeves gouache and am trying to copy an old Icon which is going fairly well so far. The problem I have is when I try to overpaint and the initial paint starts to run into the new layer. I was wondering if it is possible to use a mat varnish light coat to fix the first paint. As I live in Sydney, Australia it is not easy to find any shops which can help me with what to use and how to do that. By the way, I am painting on a stretched canvas material and it seems to take the paint very well and the look is nice. I thank you in advance and really appreciate your work. Hi I was lucky enough to be taught how to use gouache many moons ago by a VERY strict teacher , who showed me how to avoid lifting of paint layers. The trick seems to be to use the paint at the correct consistency- about that of thick double cream, AND to wait until the area to be over painted is COMPLETELY dry- not very long! I use gouache of choice when working away from home, as it can be used very sparingly and economically with maximum effect, and can be condensed into an extremely small kit-great for someone who has to rely on Shanks’ Pony for transport! I also use glued blocks of watercolour paper , which are easy to transport and don’t need stretching. However, I’ve recently rediscovered the joys of Hahnemule paper – a super texture for lovers of Rough surface painting, like me! They do a tin of prepared postcards- not glued so less convenient when painting on location in a gale, but never mind! Valerie, I apologize for being so slow in responding. I’m glad you find the information helpful. Thanks for visiting and for the very nice comments! Ok, let me see if I am successful here! I have been unable to log in here but just changed my password, so hoping that you will get this post stating my appreciation for your work and your sharing! I love reading what all the others are saying as well. Blessings! You. Are. Welcome. Thanks for the compliment! Thanks for all the info, I am experimenting with Gouache after seeing Marc Hanson’s paintings. I attended a workshop of his this summer and he shared his notebooks filled with gouache paintings. Really nice work! I really like it as a medium, has the best qualities of both watercolors and of oils. I just finished a painting and will now try and varnish it. Nervous about that. I have experimented painting in oils on Arches paper which I really like and I bet it would receive gouache really well. Marc is one of the best gouache painters I know. Glad I can add a little bit of info. Thank you for the information. I’m experimenting with gouache. Hi Nate. Hope you’re enjoying your experiments. This was wonderful info. I still have a question, I bought a starter kit for caligraphy and I came with two tubes of gouache and ni instructions for them. What could they be for? Valeria, I’m guessing that the gouache is to cover mistakes. I can’t imagine gouache being much use in a pen, so you’d need a really tiny brush. bareaa, I really can’t answer your question. I’ve never used metallic colors. Thanks. This was so informative, thank you so much for creating this blogpost! I found it by searching google for ‘how to paint gouache’. Beautiful artwork!! I am an argentinian painter who is absolutely in love with gouache. Your site was extremely helpful, specially about supports. Just one question: do you apply gouache over an acrylic gesso? Does it adhere or stick on properly? I never heard that (maybe I misunderstood). By the way, i read in a book about medieval gouache techniques that to avoid cracking while using gum arabic you must add a few drops of honey (it works!). Regards. the web without my authorization. Do you know any solutions to help stop content from being ripped off? Canvas Prints: Unfortunately, there are always going to be plagiarists and copiers who will display your work as their own. Short of spending a lot of time and money and frustration taking people to court, I don’t know of any good solution. A facebook artist Friend once posted a small painting that looked awfully familiar. I commented on it and he reposted it with my name credited for the idea. It wouldn’t have been a big deal except that the composition was an exact duplicate. There have been a couple of other questionable incidents, and I suspect there are other instances I just don’t know about. But here’s my attitude: I started writing my blog with the idea that I was sharing what I was learning and doing with other artists because I was using a painting medium that most were not familiar with. Over the years, people have come to me for additional advice and treated me like an expert of sorts, but all I’ve been doing is blindly finding my own way and sharing the process. People did the same for me when I started painting. When I started, I said that I just wanted to paint and share, and if I ended up as a tiny footnote in some artist’s biography, that was more than most artists through the ages have done. We all like to get credit for what we’ve done or written or created, but at the age of 70, that’s not a battle I’m interested in anymore. People without a conscience will not be deterred. Others might add a credit if they’re called on it. The only recourse is a legal battle, and that costs money and I’d lose on that fact alone. Sorry, but that’s a long way of saying, I don’t have a solution unless you want to communicate with those folks and complain or threaten them. I do wish you all the best in your endeavors. Thanks for taking the time to look at the blog. Samuel, I always enjoy talking with students when we do festivals and markets. It’s nice to know I can do the same thing online. Thanks! I think it would be fine on watercolor paper. Just keep in mind that if you use it very thickly, don’t bend or roll the paper. Over time, the dried gouache could crack. I tried using it on regular paper…/sheepish laugh/ it ended up being muddy though. Thank you for finding time to read and reply to my comment! Thank you again for the tips/reminders! Elke, I have attempted to overpaint acrylic paint, and not had much luck. However, I HAVE painted over acrylic gesso with some success. BUT… I’ve had to do it very carefully (light brush strokes and thicker paint), AND I have always applied a spray varnish over the finished piece. I believe there is a section in the Painting With Gouache page where I cover this. Some nice effects can be achieved, but they are almost always the result of accidents and not intentional. Thank you for this informative page! I have fallen in love with gouache and you have the most comprehensive reflections. What is the difference between gouache and casein? I believe that the link to the blog of Maggie Latham with more information is broken and I could not find her page on gouache through a search. Thanks for a motivational information about working with gouache. I would love to start trying it out. Thank you very much for posting this informative article on painting with gouache. It was just what I was looking for after deciding to pick up up the real thing (brushes and paints) after dabbling in on a WACOM Intuous device armed with Corel Painter. Thank you, Barbara! I’m glad it’s helpful. Ive just started with this medium and found your page. I am having loads of fun but have so much to learn. Ill be sure to be visiting your site often! Just thought Id let you know. Thanks, Trevor! I hope it makes some difference for you. Thank you so much for your blog. I feel that I have a better understanding of how to paint now. I joined a watercolor class several months ago so I could put some of my drawings in color. I am doing a little better but I am not quite satisfied. I feel a little better about my paintings now that I have read your message. Thank you. Gouache may be a new medium for most artist today but not for the old Illustrators in newspaper and magazine ads. Fine artist primarily used Oils but for an Illustrator who needed a cheaper medium that quickly dried to meet a deadline, gouache was the easy choice. I enjoy painting with them today. Robert, I apologize for the delay. For some reason, I don’t always see these comments. You are absolutely right, and I think I mention that in the blog. Quite often, I look at some of those illustrations, and wonder how they did it. Sorry for the late reply, Maureen. I’m happy to be a part of your new awakening. Very beautiful. Been considering upswing gouache for planning oil paintings. Your article was very helpful. Thank you. Annie, I met a museum director who rarely let anyone visit his studio. Because I worked in gouache, he invited me up and showed me the preliminary portrait work he did in gouache before starting the actual oil paintings. I was amazed at what he did. I was only there for an hour or so, but I would have loved for him to teach me how he did it. Glad I could be of some help. Ed Z, thanks for those very kind comments. I had to decide early on if I was going to be secretive or simply share what I learned as I went along. I never liked it when other artists didn’t want to share, since what we do is never completely original. I believe it’s all based on a cumulative learning process through the generations of artists. Thanks soo much! as a high school student experminting new materials you provided a great piece of writing on gouache so i can understand it from all perespectives! Huzaifa, I hope the information is useful for you. Thanks for writing! I found your page very interesting and useful. I was given a set of Gouache paints (cheap chinese brand) amongst them was a 12ml tube of “mix colors oil”. I usually paint in Acrylic or Oils and have done for 30+ years. So I though I would give the Gouache a try to see if I like them for small cartoons that I sometimes do for my grandkids. I can’t work out what the “mix colors oil” is for. Was this a tube put in the wrong box or is there a reason I don’t know about yet. I sent some letters to Magi-Wap Culture Articles Ltd Hong Kong….but never got any replies. Dave, since a quick google of the term doesn’t turn up anything, and since these are cheap Chinese paints, my guess is the same as yours: that someone on an assembly line dropped a tube in the wrong box. And I’m also going to guess that the label is just a poor translation into English. Quality control isn’t a high priority in a lot of places. That leads me to believe that it’s a tube of some kind of medium for use in mixing oil colors. Best I can do. Elinor, I can’t answer that for sure, but my guess would be that it’s not the same. Multimedia board is thin and solid.Illustration board is paper layers. Thank you Ralph for posting this. I have been working with oils but am running out of drying space and want to experiment a bit by using gouache to paint a large canvas. I am hoping that a good layer of gesso will help absorb the paint and that it won’t crack. I do like to use impasto techniques but will try not to load up the paint too thickly for this reason. However I am sure that my work will be alright because have found the top quality Lascaux Gouache which comes in large containers and is uniquely modified with acrylic tempra paint, which looks like it will be more pliable. I am looking forward to using it and seeing what outcomes I have. I was please to read you varnish your paintings to fix and protect them and especially pleased that it restores the colour (a bit like oil paint which can sink in places) because I intend to use spray varnish to revitalise and fix the work. Seek and you shall find! Thank you for all the excellent information on your blog spot about this medium, which is the only one I haven’t tried properly over the past decades. But as I am also restricted to room now, with spare one doubling up as grandchildrens space, art studio, reiki healing room, etc, I decided yesterday to give gouache a go, with Pastels and oils packed neatly away. And loved it. Even more when I found your website today, with your lovely paintings, and that posts were ongoing from 2008 until now. Ps. Did you get round to your motor homing dream? We lived in a Winnebago for several years (UK), and I did a few animal portraits but it was tricky, and messy! All the best. Caroline Roberts. Caroline, we did get to travel in the motor home for about 3 years. We currently live in an RV and hope to get back on the road some once we deal with some health issues.Thanks! Thanks for the visit, Caroline! Check out my blog http://www.backroadsandbrushes.wordpress.com Gouache is ideal for small spaces, and easy to put away when not being used. A great refresher course for me! Gouache has always been my medium of choice. I learned about it art school 35+ years ago and used to paint quite a bit in my 20’s. Due to work schedule and family I have not picked up a brush much in 20 years…..until recently when I decided to paint a portrait of my beloved border collie who died at the ripe old age of 15. I realized how much I missed painting, and how much I’d forgotten. Your step by step article was a great way to get my creative juices flowing again. Can’t wait to start painting again. BTW – I used to spray my paintings with Krylon to. Thanks for the kind words, Lori, and it’s nice to know someone else sprayed their gouache work! Thank you SO MUCH for this post! I am a designer who has been dabbling with watercolor but am also interested in possibly introducing gouache paint with my watercolor work. This post has been so informative and helpful! I feel like I really understand gouache now and am even more interested in trying it out. Also, I love your realistic, no-fluff style of writing/conveying info. I was really able to learn a lot. Thanks, Becca! I’ve always hated reading art articles that try to impress with a lot of artspeak. I wanted the blog to be straightforward. Looks like I’ve succeeded. You are a very talented painter and thank you for explaining the gouache process. i found your site while researching the French painter Maurice Blanchard, 1903-1969. He worked with oils, gouache and watercolors. I own one of his paintings, I believe from 1932. I had always thought it was oil, but the auction houses show that he worked with gouache too. I’m listing it for sale and don’t want to misrepresent anything. I’m hoping that you might have a look and see if you could tell me for certain that it is gouache. He wrote in pencil on reverse “11:32 rouge gorge via quete” there are some other words that I can’t make out, but one word looks like “faux”. The best translation is “Red gorge via search.” He has signed it upper right hand corner. The colors are very bright and the painting has a glossy look. My painting is nearly identical to others on mutualart.com. The scene is of a small French village in autumn. High on the hill is a church and steeple and in the foreground is a family and their little white dog. The family are waiving on a train pulling into the village’s station. Would you care to look at the pics and give me your opinion? If so, I would send you front and verso. I’m listing it for sale and don’t want to misrepresent anything. I’m hoping that you might have a look and see if you could tell me for certain that it is gouache. He wrote in pencil on reverse “11:32 rouge gorge via quete” there are some other words that I can’t make out, but one word looks like “faux”. The best translation is “Red gorge via search.” He has signed it upper right hand corner. The colors are very bright and the painting has a glossy look. My painting is nearly identical to others on mutualart.com. The scene is of a small French village in autumn. High on the hill is a church and steeple and in the foreground is a family and their little white dog. The family are waiving on a red train pulling into the village’s station. Would you care to look at the pics and give me your opinion? If so, I could send you additional pics of the front and back. I just want to say a big thank you for sharing this useful and personal non artspeak information. After essentially 3 decades of absence of brush to paper with gouache, I’ve finally gave myself permission to reconnect to art making by hand (as opposed to computer having been a professional commercial graphic designer for too long). I’m crying tears of relief and gratitude as I write this because your article has triggered deeply buried memories of the joys in experimenting with mediums and image making In my youth, and now in my mid 40s I’m essentially going back to that time and picking up where I left off – pencil, pastels, acrylic and gouache, now that I have a little time to myself when my youngest is in kinder. I have tried oils once, took an evening course facilitated by a working artist in her studio, like every medium it takes some getting used to for its characteristics. It wasn’t as hard as I imagined it would be. The images and style I want to make I don’t envisage oils being suitable for as I’m turning more to small size illustrations but I saw interactive acrylics in my local art store which I don’t think was around when I was a kid dabbling in this stuff. I do feel there is for me anyway, a work in progress from pencil to oils as a medium that is married to ones own personal journey evolving as an artist. Once again, thank you for all the practical info, the links, the sharing of where you were at when you wrote this – it’s enough to inspire and encourage me on my return back to art. Hi Sam. Thanks so very much for stopping by and for these very kind words. Your timing is impeccable. Take a look at the blog article I just posted titled “Keeping Dreams Alive”. I’ve wondered for ages what gouache was…..now I feel very knowledgeable in the subject. Thank you! Hi Joy. If I helped a little, I’m glad. Thanks! I did a gouche on cold press paper. Can I still spray a varnish on it ? It’s a commission and I can’t risk ruining it. If you haven’t done any varnishing, I wouldn’t start with a commission you can’t risk ruining. I’d put it behind a mat, or suggest that the recipient do so before getting it framed. Better to be safe. Hi Fred. The answer to your question is a bit involved. I cover it pretty thoroughly in the “Varnishing” section of the article Painting With Gouache. Thanks Ralph! I have been searching and searching for detailed information on how to use gouache, and at last here you are with your beautiful work and generous nature. Over the last 20 years I have hopped from Acrylics (ruined lots of clothes) to Watercolours (OK but missing something), and now I have decided to try Gouache. But to find really informative information for a complete beginner in this medium, but not an novice to the joys of amateur painting, is like looking for hens teeth! So far I have only read your article on page one of your site, but already I can see you are going to be such a help. Being keen about a month ago I bought Royal Talens Yellow, Permanent Rose, Light Blue (Cyan), Black (all 20 ml tubes), and a 60 ml tube of White. Then I came to the proverbial grinding halt because I really wanted to know about suitable surfaces before wasting paint with my initial trials. I do believe that when choosing a support it has to match the medium, and you have explained this perfectly. Thank you! Needless to say you now have another avid follower. Thanks for visiting, Bridget! I’m trying to share what I know without being too technical and without too much artspeak. I’m glad you found me. Hi Ralph . Great info. Are you on your travels yet? I hope so. Go go gooo. I am an oil painter and also work in colored pencils. Recently I purchased a set of gouache colors to try out and have been searching for information on how to use them. Your post was the most informative by far! Thank you for sharing so much experience and information in one spot! My pleasure, Kathleen. I’ve just about finished a little book on gouache that I hope will be available before long. Hi, I came across your site when researching the technique of UK comics artist Don Lawrence who apparently used gouache on illustration board to incredible effect. Have you seen his work on “Storm” in the 1990s? Lots of images on the web. Hi Arthur, thanks for the introduction to Don Lawrence’s work. I’ve probably seen some of it in the past, but wasn’t familiar with his name. Like a lot of others, I started drawing as a kid who was immersed in comic books. Even as an adult, I did my own simplified versions of scenes like his “Samaria Falling to the Assyrians”. Nowadays, in my 70s, I find myself moving back to those roots. Nice to hear from you! I have a painting that looks very much like the one you are working on on the eisle in the photo above. I also have a second one that has a little house in it with an orange roof on a hill. They make a pair in matching frames and the pictures are about 22″ x 28″. I don’t know if these are real paintings but I thought they were beautiful and love them hanging in my home. I picked them up at the Salvation Army store one day. The signature looks like m Parker not r parker but they look like your work. The reason I’m writing this is because the paint is cracking any pealing and I am heartbroken about it. It looks like plain card board behind the paint in the now bare spots. I was trying to look up the artist on the net and I ended up here on this site. I would like to find a way to repair or replace these if possible. Can you tell me if you may be the artist and if so are my pictures real or fake copies. I paid $25 apiece for them. I loved the colors and the peaceful landscapes in my living room. I have tried to include a photo but I can’t seem to get it to work. Maybe I could email one to you. Leah, could you please send me an email at ralphparkerstudio@yahoo.com? On the subject line put Peeling Paint. Thanks. Thank you for your time in doing all of this. It has been very informative. I will be trying gouache. Thank you, Brenda. It has been a labor of love for me. Be sure to check out my book as well. Enjoy your gouache adventures.! This is a fantastic article. As someone who is learning to paint mostly from online lessons, getting to see someone’s workflow is and thought process is very helpful. Thanks! I’m happy that you’re finding the information helpful. Thanks for checking in! Hello, Ralph, I follow your work and bought your book as I love gouache, though I like casein even more. They work in similar ways. I thought you might like the videos of this artist. Thank you for continuing to inspire and support artists. Thanks, Andrea. I like the phrase “real paintings”. I was determined to do that with gouache. I’m glad you feel that way. Greetings, I’m painting plein air with gouache and have achieved moderate success. I recently read that the pre-raphaelite painters used gouache and achieved brilliant color by first laying down a layer of opaque white and then adding color wet-into-wet. I’ve had a hard time tracking down details of this process and wonder if you have any information about it. Thanks. Hi Ken. Sorry, I’ve never heard of this. It does sound interesting, though.